Rava Kesari, or Semolina Kesari, aka, Indian Semolina dessert. But if you are expecting a typical, authentic and traditional Rava Kesari, I think you will be not pleased. Why, are you asking me? Well, if you can remember me telling you that I like to play around with recipes? I like to tweet recipes and I like to break free from recipes which may have existed down the generation. Please don't get me wrong (Watermelon Sorbet, Creme Caramel, Cream Puff & Fried Apple Fritters). Of course, we must hail and respect handed down from generation to generation original recipes, but is there anything wrong if we want to coin another version? For me personally, as I have already told you, I prefer some thinking of mine included for traditional recipes(Sago Gula Melaka, Chocolate Rum Tart, Mango Cheesecake & Honeydew Sago). For this my version of rava kesari, I am sure you must be wondering why you are not seeing those yellowish kinda and alike generally kesari? Basically, I am not fond of coloring unless it can be affirmed that coloring is of quality. Otherwise, I rather do away with coloring and for this my version Rava Kesari, I added saffron strands (Saffron Poached Pears) which by far as you know or don't, you got to pay more compared to the bottle of yellow color. Of course, the choice is yours and instead of cardamom, I decided to go along nutmeg powder for scent. Nevertheless, nothing should stop you from using this idea of mine and then coming up or using other ingredients for your own version (Pandan Cheesecake) of Rava Kesari. 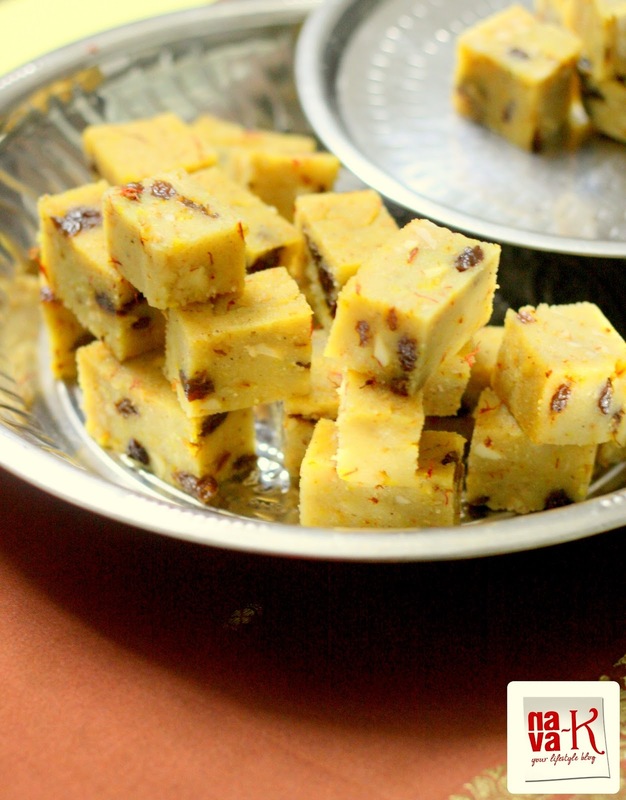 Having said that, wouldn't you agree this Rava Kesari is a dessert show stealer? Heat ghee and when heated, fry almond pieces till crispy and light brown in color. Do the same for raisins - fry to blister, remove and keep aside. Pour water in the same pan, add sugar and saffron. When the sugary liquid starts to simmer, add semolina. Stir and stir to ensure semolina doesn't remain lumpy. Add fried almond and raisins. Stir once or twice, tip into a greased pan/tray and spread evenly. Cool down and cut into pieces. expected usual round kesari,surprised by the square kesari,lovely presentation. You are absolutely right when you say saffron can enhance the taste of kesari not just by giving the color. I love the flavor of them pretty much on any sweet, especially shrikand. Your kesari looks yummy and I'm used to having kesari in a flowy consistency but I think have them cubed is a good idea. Looks more cool. you are a good cook! Having followed u for so long. You always have different recipes for different type of food/cuisine! Oh Kesari looks so inviting Nava I can almost get the ghee smell here.I always wonder what the box of saffron would contain when I see cheaper boxes. This was my go to recipe to make anytime we have guests.Now I don't even remember when I made it last. I should make it again someday. I love saffron and extensively use in making biryani and other sweet dishes. You have nicely done it in perfect square and almond sand raisins look like jewels. Beautiful! Irresistible kesari. I love the color and perfectly cut cubes. I add cashew nuts instead of almonds. Delicious. 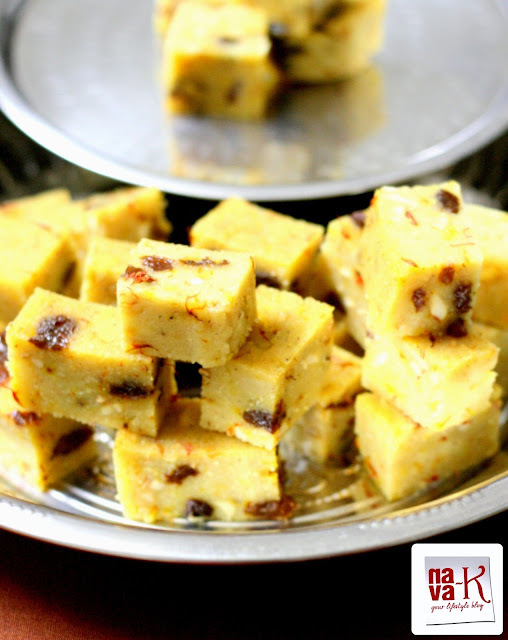 Hi Nava, I love sugee cake but never try kesari...looks very inviting with the colour and almond and raisins, wow, awesome! Just read two days ago about the benefits of semolina (at least feel better eating the pasta, not just enjoy it but get health benefits too), now this dessert-sure learnt a lot from this article and what a classy and mouth watering offer. Wish I could grab one block of the kesari. First time seeing it cubed. Good idea and luv the yellow colour. it looks perfect.. and like the color too.. I will like to try these since I never did and they look so delish. Looks so inviting..yum yum ! !